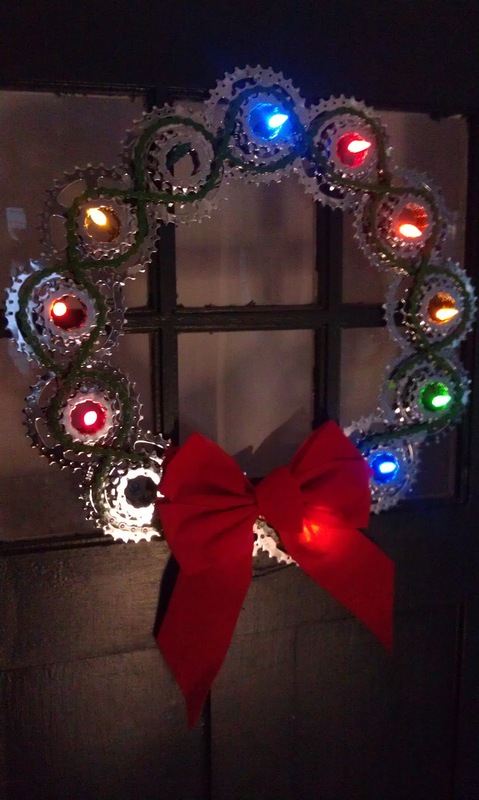 I closed last year's Christmas post with a shot of this: the DIYBIKING.COM Signature Wreath. Actually, I built it more than four years ago, before there even was a DIYBIKING.COM. I had just gotten into welding and found a bunch of cassettes on closeout at Nashbar. After discovering they were a pain to work with, I tried bolting them together to make a wall hanging. But the bits never came together in a straight line, and I soon found that thirteen cassettes (with a few of the gears removed) could make a circle. A spray-painted chain held in place with a couple of clear wire ties completed the look, along with a nondescript red bow and a string of battery powered LED lights (which, by the way, can make a bike look Christmasy and keep you safer riding at night). The wreath has hung on the inner door of my house every Christmas since. This year, however, I didn't stop there. A few weeks ago, shortly after returning from Cleveland, I lifted a bike from the Metal Only bin gently but firmly and brought it into my basement. It was a Korean bike and I hadn't heard of the 'Response' brand before. A few twists and turns of spanners and screwdrivers got the bike in decent working condition, and then I did something nobody should ever do: I inflated the tires to their maximum allowable air pressure. It's okay on a new bike or a bike you're confident in, but for something you took out of a rubbish bin that probably hasn't seen a bike pump since Reagan's first term, it's not advisable. So my wife and I are sleeping peacefully that night, and about an hour before sunrise…a gunshot - think Old Man Peabody firing at the spacecraft that destroyed one of his pine trees - shattered the silence. I barely stirred, knowing exactly what it was. "It was a bike tire. Go back to sleep darling." A shuffled walk to the basement later, coffee cup in hand, I confirmed a tire had, in fact, exploded approximately twelve hours after filling it with air. With no ability to fix the bike without a replacement tire, I decided to respond to the Response's breach of peace by skipping to what I knew would be the last stage of its life: being cut up and used to weld something new. However, the bike still looked okay, and I knew I wouldn't have time or enough materials this holiday season to weld something new anyway (side note: I am desperately trying to find old steel bike frames from the 1990s or earlier, so if you have any you want taken off your hands, please let me know and I'll happily collect). 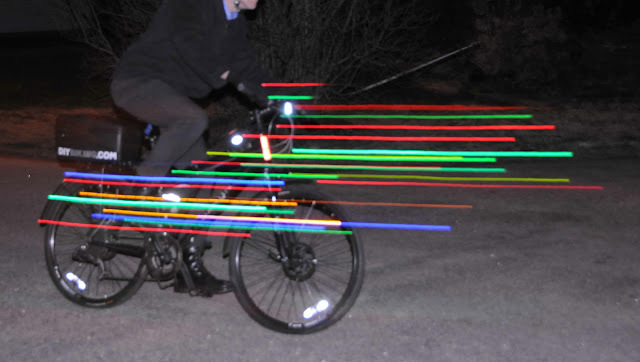 So I found a couple of strings of Christmas lights and, 120 LED's later, the bike was on my front lawn basking in Christmasy glory - it's last official stop before it heads to the Dexter Morgan kill room of workshops sometime in early January. The nice part about this kind of decoration is that it didn't involve me going on a scary ladder to attach lights on anything. This year, as a safety measure, all outdoor holiday decor goes below eye level. I decorated the house with some of the usual stuff. I'm a 'colored lights' person and my wife is a 'white lights' person. In exchange for conceding on a much underreported area of human differences, I get to hang anything I want on our 'tasteful' white light tree, and I like hanging up things that were toys from my youth, and I highly recommend doing that. There's a gun in his hand because, you know, he shot first. There's a Tuskan Raider on the tree too. On the other side so they don't fight. My wife caught me removing Greedo so he'd have better light for this picture and her face fell when I told her I wasn't taking it off permanently. Just for that, I'm adding Chewbacca. Circling the tree is a model train. Circling every tree should be a model train. I think it is a sticking point of the Fiscal Cliff negotiations. Now because I took out a number of gears from the cassettes that went into the wreath, I also have converted some of the smaller gears to ornaments. You can do this too: it's just a metal ring looped with one of those metal ornament hangers, which, if you want to save yourself some time this year, just go ahead and carefully wrap one in the spinning brush of your vacuum cleaner. The wreath, as I learned since I posted it on this site last year and on Facebook this year, has a pretty broad fan base. Some have requested that I build one for them or made veiled offers to buy the one I have. I know for sure I'd trade this one-of-a-kind for a Brompton, but in terms of cash offers I'm still not sure what the Buy-It-Now price is. 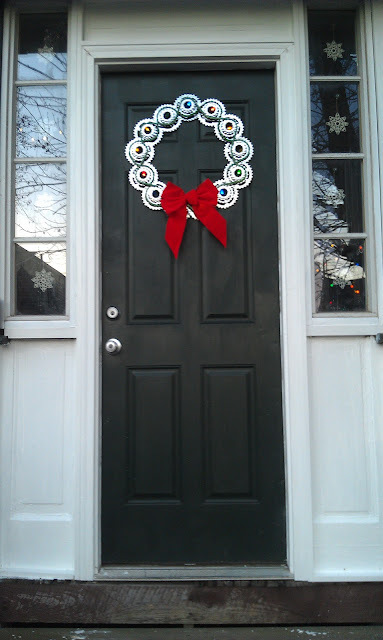 Now because of the sheer weight and value of the wreath, it has always hung on the inner door of my home so you can't see it when you're outside. But after years of getting a brochure from the Shippan Point Garden Club about their 'Doors of Shippan' wreath contest, I decided to find a way to give my wreath the attention it deserved. There were two problems: the wreath contest rules appeared to be written with wreaths that had been made of tree or plant material in mind (it is sponsored by a garden club, after all). Wreaths with real plant material were encouraged and wreaths with artificial plant material were discouraged. I emailed a member of the garden club asking for a clarification: what about wreaths that were not made of any sort of plant material, real or artificial? The next morning, I got a response indicating that I could in fact, enter a wreath that was devoid of plant life. Even though my wife was skeptical my wreath would be taken seriously since the contest was not being sponsored by the Shippan Point Garage Club, I decided to enter it in 'Category 5' - My Favorite Things. The other problem, my wife pointed out, had to do with presentation. The white paint around our front doorway was flaking off and missing several key pieces of white trim. For a couple of years several artfully applied pieces of white duct tape served as (I thought) an acceptable substitute. You're entering a serious contest and presentation matters, she reminded me. 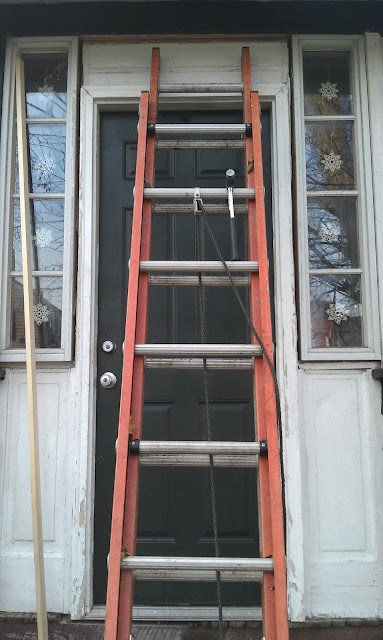 After much grumbling, I visited Home Depot last Sunday afternoon, bought several feet of trim and white paint, climbed on a dreaded scary ladder, and did what needed to be done. What was particularly frustrating is that I wrapped up the last of the painting shortly after dark that evening. Because I go to work before dark and come home after, I wouldn't know until the morning of the contest how it would look. I went to work a little on the later side that morning so I could secure the wreath. I put fresh batteries in the string of lights and left for the office, hoping the lights would still be functioning by the time the judges arrived. I had a full day of work as the judging, which was to begin at 9:00 yesterday morning, took place. As it happened, I had to go to New York that night to meet my wife and a friend of ours for the friend's birthday dinner (that's why I didn't call - sorry, Mom and Dad). We didn't get home from all of this until shortly after ten o'clock last night. As we headed up to the house, I was surprised to see the wreath was still lit - not as bright as it had been this morning, but those were still some good batteries I had put in about fifteen hours earlier. Also, there was something hanging on the doorknob. It was too dark to see so I used my phone's camera flash to get a closer look. So there you have it. It was more than I expected to win as I do suspect my disregard for both living and dead plant material on my wreath may have put it at a disadvantage, but it was something, and I do thank the Shippan Point Garden Club for this award. 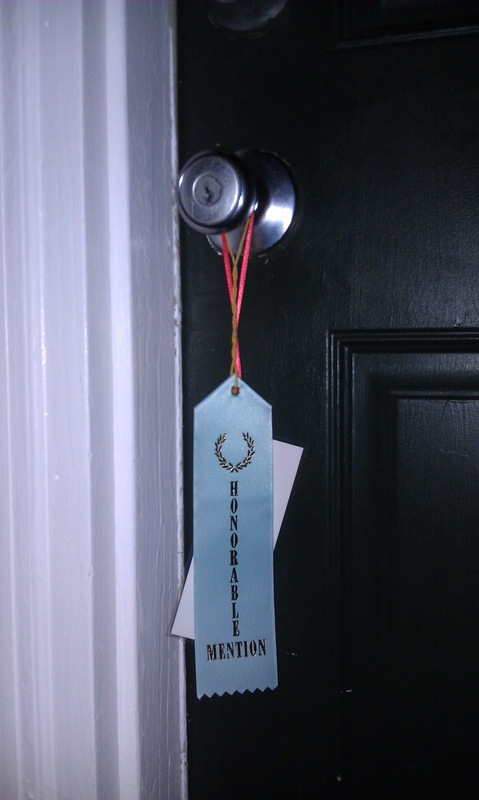 There was also a laminated tag thanking me for my entry and for taking part in beautifying the neighborhood. I guess they were really right on that score: if not for the contest, I probably wouldn't have spent that nice Sunday afternoon installing and painting the trim - which will make the house look better year round. So whether there is the prospect for a ribbon in your future or not, consider decorations this year that shows the world you are a cyclist, and do what you can to make your neighborhood beautiful. Thanks for reading and thanks for riding.